A myofunctional device corrects crooked teeth and jaw misalignments through proper myofunctional habits, the position of the lips and tongue during breathing, swallowing, and sleeping. This is a relatively new treatment for crooked or unaligned teeth and jaws which may be an alternative to braces. Myofunctional devices work on correcting the underlying issues that cause crooked teeth and jaw misalignment, instead of using pressure to force the teeth into a new position, like braces do. Dentists and orthodontists have practiced myofunctional orthodontic techniques around the world for over 50 years, however the development of a myofunctional device system as a possible alternative to braces is relatively new. The most common myofunctional device system, and the one offered by Boston Dental Group in Las Vegas, is called Myobrace®. This system is quickly gaining popularity, especially since it offers a less expensive orthodontic treatment with less discomfort for children. How Does a Myofunctional Device Fix Teeth? Myofunctional devices can correct even extreme cases of crowding and misalignment early on in a child’s life. Myofunctional devices like Myobrace® look like mouthguards, but they are constructed especially to promote proper jaw development. These devices are designed to fix “incorrect myofunctional habits;” the position of the lips and tongue during rest, swallowing, breathing and sleeping. Unlike braces, myofunctional devices and Myobraces® only need to be worn for an hour a day and during sleep. They are safe, painless, and effective for children as young as three years old as well as adults. This offers the additional benefit of correcting dental issues early on in a child’s life, so they enjoy straight, beautiful teeth sooner. Children can be fitted for the myofunctional device system Myobrace® at three Boston Dental Group offices located across Las Vegas. Why are My Child’s Teeth Crooked? Can Myofunctional Devices Help? A growing body of research on myofunctional devices shows that teeth and jaw misalignments (called “malocclusions” by dentists and orthodontists) are not caused by hereditary factors or even random chance, but rather by the subtle, but constant forces exerted on teeth by the surrounding muscles, mainly the lips and tongue. As a child’s teeth come in, the constant movements of the surrounding muscles determine how the jaw and palate develop. These movements, called myofunctional habits, include swallowing, breathing, sucking, and the resting position of the lips and tongue. When these habits place consistent pressure on the right areas of the mouth, the jaw develops normally, with plenty of room for teeth to come in. When pressure is not consistent and does not encourage the jaw to grow properly, teeth become crooked and crowded, and the jaw does not align properly, causing overbites and underbites. Are Myofunctional Devices an Alternative to Braces? Myofunctional devices can and have been an alternative to braces for many children. The use of a myofunctional device system to correct malocclusions has yet to gain the popularity orthodontic corrections like braces, but the devices have effectively erased the need for braces in many of the children that have used them thus far. However, each child is different and myofunctional device correction is commonly used long before orthodontic treatments would be possible. 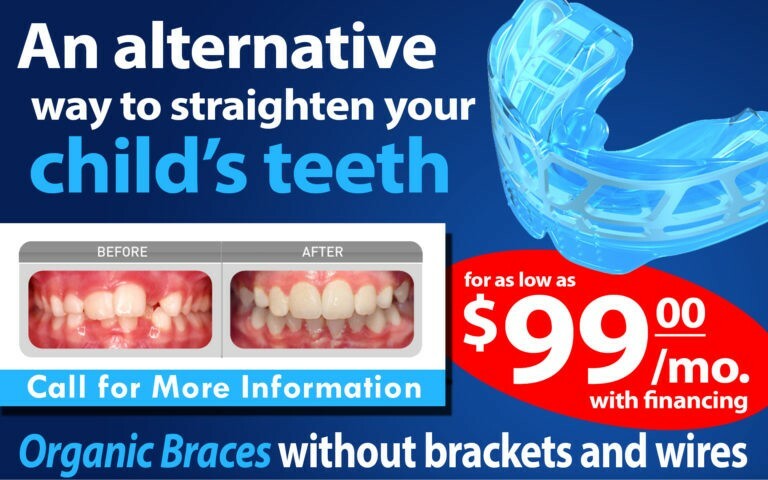 Therefore, it is difficult to say for certain whether or not the child will benefit from braces later on. When you visit one of the three Boston Dental Group locations offering the myofunctional device Myobrace®, your dentist can tell you more about the impacts, and about the use of Myobrace® as an alternative to braces. Are Myofunctional Devices Right for My Child? There is no risk to myofunctional devices, and these devices have effectively corrected even extreme jaw or teeth misalignments. Make an appointment at one of our three Boston Dental Group locations in Las Vegas and North Las Vegas to learn more about convenient and stress-free myofunctional device treatment near you.